The Weekly Reader answers this question by featuring the crème de la crème of recent releases in four action-packed, opinionated, book-loving minutes. It’s like having a new best friend with very good taste to guide you in your literary adventures. The Weekly Reader theme song is produced by Vince Winik. 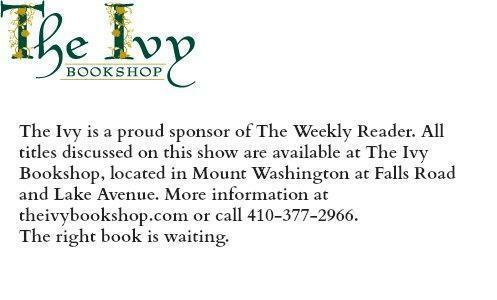 Did you know WYPR’s radio program The Weekly Reader is a book club too?! At WYPR, we love books. That’s why we created The Weekly Reader book club in partnership with our friends at the Ivy Bookshop. The book club will meet on the second Thursday of each month with hosts Emma Snyder and Lisa Morgan, with resident critic Marion Winik, and a handful of guest authors throughout the year! Click here for more information, or check out the "Events and Community Calendar" tab at the top of the page. On this edition of The Weekly Reader, we preview "The Secrets Between Us," Thrity Umrigar's highly anticipated sequel to her best-seller "The Space Between Us." On this episode of The Weekly Reader, Marion Winik has two new titles to recommend for your next book club selections. *"An American Marriage" was selected for WYPR's Holiday Reading List 2018. On this episode of The Weekly Reader, we preview three Young Adult titles that are fun for slightly older fans as well as the teenagers in your house. On this edition of The Weekly Reader, two new novels by first-time writers that explore the intricacies of relationships within Muslims families in the modern world. On this edition of The Weekly Reader, two books about scary nightmares that may or may not be in our future. Dystopia, ho! On this edition of The Weekly Reader, we feature two new novels that both have a distinctly Asian flavor. On this edition of The Weekly Reader, we bring you two additions to our growing list of summer reading recommendations. On this edition of The Weekly Reader, Marion Winik shares two new memoirs about women leading unconventional lives and relishing the things that make them different. *"Educated" was selected for WYPR's Holiday Reading List 2018. On this edition of The Weekly Reader, a look back at some of Roth's best work, plus a great biography about him and a book inspired by his novel, The Ghost Writer. Today on The Weekly Reader we review two books that tackle a difficult subject - the aftermath of a traumatic brain injury - in very different ways. Summer is right around the corner, and on this edition of The Weekly Reader, our book critic Marion Winik shares a pair of books that are not only great reads, but summer itself plays a starring role in both stories. On this edition of The Weekly Reader, we review two books that feature characters that break the mold of the typical leading lady, reminding us that interesting people come in a variety of styles. On this edition of The Weekly Reader, a pair of books that look at the ways in which money, or a lack thereof, changes our lives and relationships in a wide variety of ways. On this episode of The Weekly Reader, two novels with fresh takes on classic tales. On this episode of The Weekly Reader, two new coming of age stories that also happen to be great reads. On this episode of The Weekly Reader, we review a pair of new novels that redefine the concept of a "quiet" retirement. If the word “essay” doesn’t trigger panic attacks and terrible memories of high school or college exams, have we got a pair of books for you! On this edition of The Weekly Reader, we feature new work from Tim Kreider and Carina Chocano. On this edition of The Weekly Reader, two books that take us behind the scenes at a pair of workplaces that might make you want to keep your day job. On this edition of The Weekly Reader, our book critic Marion Winik reviews two new novels about women who seem to lack the maternal instinct. Today, our book critic Marion Winik shares two poetry collections that she says everyone needs to have around the house for moments that call for the perfect poem. Anyone who lists Dr. Seuss, Dylan Thomas, Walt Whitman and Jimi Hendrix as their major influences is alright in my book. Today on The Weekly Reader, we talk about the late, great Denis Johnson. On this edition of The Weekly Reader, we review three new books that explore the idea of immortality. Who doesn't want to live forever?